We enjoyed smearing ourselves with the very warm and silky mud from this pool at Colossae Hotel near Pamukkale and Laodicea, Turkey. Gloppy handfulls of mud really did refresh our travel weary bones and joints. You smear it all over your skin and let it dry until it turns light gray and starts flaking off. Then you get to rinse it all away and enjoy the fresh sensation of "youthful skin" again. Of course you also get to enjoy the laughter of any nearby friends and strangers. Walking toward the National Museum of China we met Bo Jin, a 30 year old art student, in the street. Outgoing, with an engaging grin and fast, clipped English, he wanted to help us with directions. He told us the National Museum was closed today because of US vice president Biden's visit and would reopen to the public tomorrow. 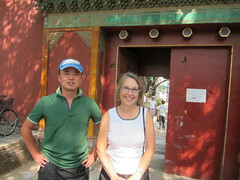 He suggested we go on to visit the Forbidden City instead. We told him our daughter, who is near his age, is also an artist and teaches at a University in Tennessee. "Oh, that's very good," he said brightly. "Now she can care for you when you are old!" On our very long ride from Jackson to Atlanta to Seattle to Beijing we discovered Delta Airlines offers an Asian version of its standard pasty personal pizza slice served in little sealed boxes on westbound transatlantic flights about an our before arrival. Passengers flying to China get a personal mini-carton enshrining a warmed-over wrap filled with a thickened mixture of chickpeas and spicy tomato. As with their pizza, after a couple of bites, you wonder if it might be nicer to eat the carton.